At sunrise, on February 10, 1675, during King Philip's War, Lancaster came under attack by Narragansett, Wampanoag, and Nashaway/Nipmuc Indians. Rowlandson and her three children, Joseph, Mary, and Sarah, were among the hostages taken that day. For more than eleven weeks and five days (Neubauer 2001, 70), she and her children were forced to accompany the Indians as they fled through the wilderness to elude the colonial militia. (Part of the territory is now within Mount Grace State Forest.) She later recounted how severe the conditions during her time of captivity were for all parties. 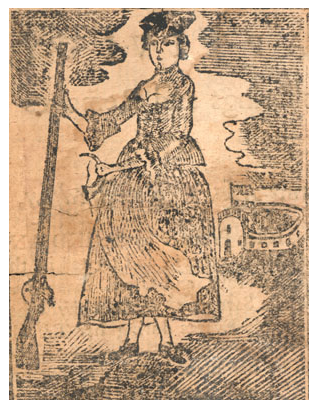 On May 2, 1675, Rowlandson was ransomed for twenty pounds, raised by the women of Boston in a public subscription, and paid by John Hoar of Concord at Redemption Rock in Princeton. After her return, Rowlandson wrote an account of her trials. In simple, artless prose, Rowlandson recounted the stages of the odyssey in twenty distinct "Removes" or journeys. She witnessed the murder of friends, the death of her youngest child Sarah, and suffered starvation and depression, until she was finally reunited with her husband. During her captivity and suffering, Rowlandson continued to seek guidance from the Bible; the text of her narrative is replete with verses and references describing conditions similar to her own. She saw her trial as a test of faith and considered the "Indians" to be "instruments of Satan". Her final escape, she tells us, taught her "the more to acknowledge His hand and to see that our help is always in Him." Until recently, scholars believed that Rowlandson had died before her narrative was published in 1682 (Vaughan 1981, 32). But, more recent historical research indicates that after the death of her husband, Mary Rowlandson re-married to a Mr. Talcott. She lived as Mary Talcott until January 1711, thus reaching an age of approximately 73 years (Salisbury 49-51). Her book became one of the era's best-sellers, going through four editions in one year. The tensions between colonists and Native Americans, particularly in the aftermath of King Philip's War, was a source of anxiety. People feared losing their connection to their own society. They had great curiosity about the experience of one who had been "over the line", as a captive of American Indians and returned to colonial society. Many literate English people were already familiar with captivity narratives by British sailors and others taken captive at sea off North Africa and in the Middle East. Her book earned Rowlandson an important place in the history of American literature. 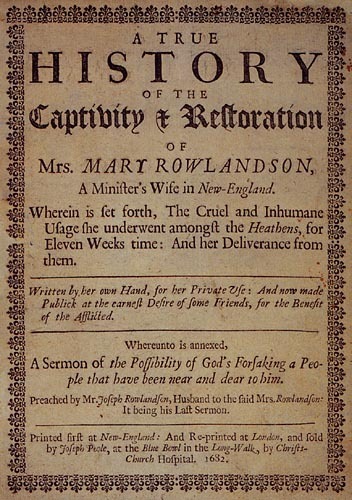 A Narrative of the Captivity and Restoration of Mrs. Mary Rowlandson, is a frequently cited example of a captivity narrative, an important American literary genre used by James Fenimore Cooper, Ann Bleecker, John Williams, and James Seaver. Because of Rowlandson's close living conditions with her Indian captors, her book also is of interesting for its treatment of cultural contact. Finally, in its use of autobiography, Biblical typology, and homage to the "Jeremiad", Rowlandson's book helps the reader understand the Puritan mind. Redemption Rock is a colonial-era historic site in Princeton, Massachusetts. In 1676, during King Philip's War, the release of Mary Rowlandson (the wife of a Puritan minisiter) from her Native American captors was negotiated atop a granite ledge located on the property. The .25-acre (0.10 ha) reservation upon which the rock stands was acquired by the land conservation non-profit organization The Trustees of Reservations in 1953, and is open to the public. Rowlandson would later write about her captitivy and release in A Narrative of the Captivity and Restoration of Mrs. Mary Rowlandson, considered a seminal work in the American literary genre of captivity narratives. 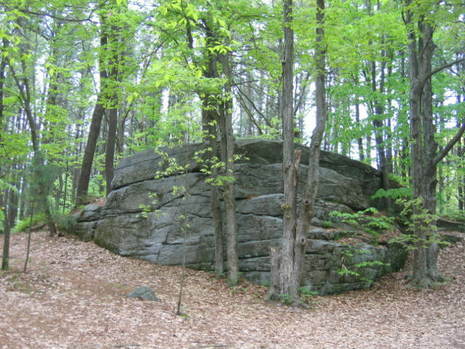 Redemption Rock is located off Massachusetts Route 140, near Wachusett Mountain.